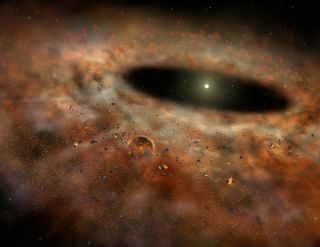 Artist's concept of the dusty TYC 8241 2652 star system as it might have appeared several years ago, when it was emitting large amounts of excess infrared radiation. Artist's concept of the TYC 8241 2652 system as it might appear now, after most of the surrounding dust has disappeared. But there's still a nagging mystery. Neither of the two theories clearly fits the evidence obtained by observations of TYC 8241 2652 1. "A perplexing thing about this discovery is that we don't have a really satisfactory explanation to address what happened around this star," Melis said.